The idea of doing a Star Wars film every year is a decent one, but one that I still kind of fear will not work. This is the first Star Wars film set outside of the seven main films (soon to be eight) and the first to tackle a story that has already been talked about in another film. This film is about the mission to obtain the plans for the Death Star which helps the rebels blow it up in A New Hope. I think this trailer looks great. Gareth Edwards is a very visual director and this thing is beautiful. Plus the film has Donnie Yen playing a Star Wars version of Zatoichi. You can't go wrong with that. Plot: Jyn Erso, a Rebellion soldier and criminal, is about to experience her biggest challenge yet when Mon Mothma sets her out on a mission to steal the plans for the Death Star. With help from the Rebels, a master swordsman, and non-allied forces, Jyn will be in for something bigger than she thinks. 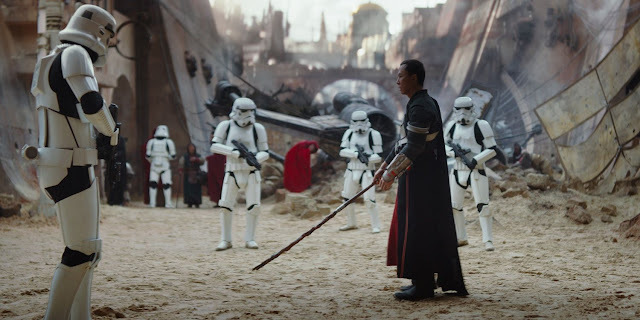 The film stars Riz Ahmed, Felicity Jones, Forest Whitaker, Alan Tudyk, Ben Mendelsohn, Madds Mikkelson, and Donnie Yen. Rogue One: A Star Wars Story opens in theaters on December 16th, 2017.